Ellis Island: Guarding the U.S. against the world’s diseases? In 1902, long before any sign of Ebola or the creation of the Centers for Disease Control, a small cluster of hospital buildings on a little more than 25 acres of land in the middle of New York harbor were the main U.S. defense against infectious diseases carried by the millions of immigrants streaming into the country from all over the world. Most of us know the story of the main processing building on Ellis Island and its cavernous hall where some 12 million people were screened before being sent on their way into Manhattan, New Jersey, or points farther north, south or west. In their day, they were staffed by some of New York’s top doctors and they arguably included the best-trained and most knowledgeable infectious disease experts in the U.S. And they had to be, given the range of diseases that found their way from all corners of the globe past the Statue of Liberty to Ellis Island, the largely man-made stopping point built up in part by dumping debris from NYC’s newly-dug subway lines. Think of it as an early version of today’s TSA airport screening. The first step in the medical screening was a spiral staircase in the main building, specially requested by the doctors, who could thereby evaluate the incoming immigrants from all angles before they were even aware that they were under observation. Anyone who had difficulty climbing that one flight of stairs drew immediate attention. If the doctors believed further investigation was needed, they put a mark on the immigrants’ clothing and sent them out from the main building down to the right through the ferry terminal, into the Y Hallway. The hallway got its name from the way it divided at its eastern end. To the left, a corridor led to the wards where pregnant women and anyone who seemed to have mental problems were examined. To the right were the infectious disease wards, where nurses and doctors could evaluate whether their disease would soon run its course or whether the immigrants should be sent back to their homeland. Most only stayed a few days, but a couple, suffering from the lingering effects of tuberculosis, remained on Ellis Island for more than a year, too sick either to be sent back aboard ship or allowed into the U.S.
Only a handful failed to get entry to the U.S., a little over one percent. Some 3,500 died on the island of their illnesses, most buried in a pauper’s grave near Rikers Island, unless they were fortunate enough to have their body claimed by a local relief organization from their particular religious or ethnic group. Save Ellis Island, a non-profit group, has now been given permission to conduct tours of the abandoned medical facilities, limited to about a dozen visitors at a time. For signup information, go here. 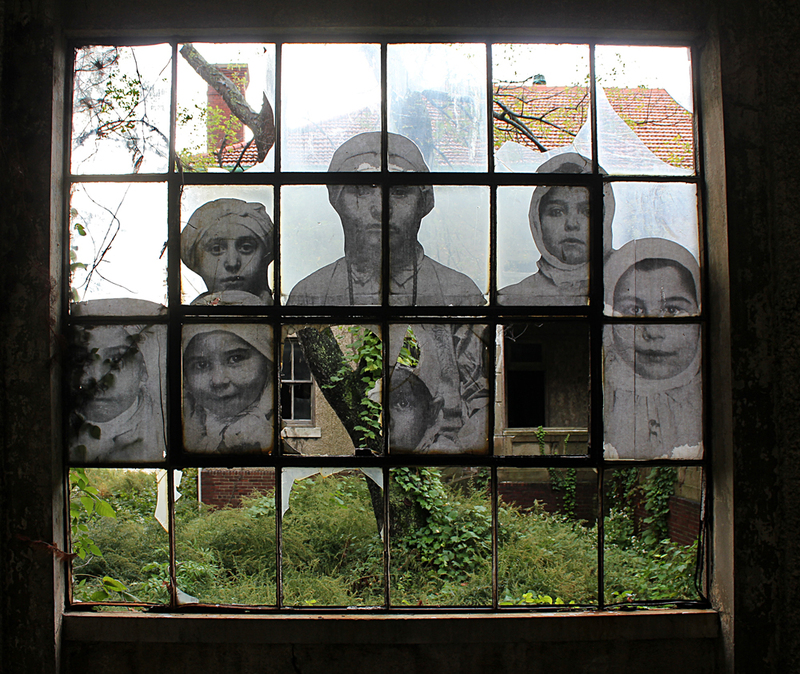 An added treat — the French artist known as JR has enlarged a number of vintage photos of immigrants on Ellis Island and superimposed them on walls, windows and doorways at various points in the tour, bringing the hallways and ward rooms to eerie life. The medical facilities are visible from the main building. Hardhats are required for the tour. The wire cage kept mental patients enclosed, as well as German detainees. The faces of young immigrants peer through a shattered window. So close to freedom, yet so far away. The long hallway runs the length of the entire medical complex. A storage cabinet is still in good shape. Water from Superstorm Sandy added to the damage the buildings have suffered from neglect. It’s easy to imagine who might have sat in these chairs. Bodies were stored in these refrigerated cabinets in the autopsy room. This large washing machine (it’s about five feet wide) was used for patients’ laundry. Some furniiture remains, sixty years after the buildings were abandoned. The bustling main buiding, just 100 yards from the abandoned medical facilities.